The ConMICO 2500W series is lightweight, readily portable and robustly constructed. In combination with one of our 2500M mixers it is mainly used for full-column grouting for cable anchoring and for spraying materials. Combining the air-motor with different riser-tube assemblies (fluid sections) adapts the pump to suit any particular need — see "Pumping Capacity" table below. All the pumps are equipped with a VTO lubricator/filter to ensure clean lubricating air operates the pump. The riser-tube is fitted with a clamp and allows removal of the tube for cleaning without the need of special tools. Pumps are configured with hoses and fittings to suit each application and can handle a variety of mixes, from a thin liquid to a viscous grout (1:3 water to cement). Other models can be manufactured to meet special needs (eg. coal mining). 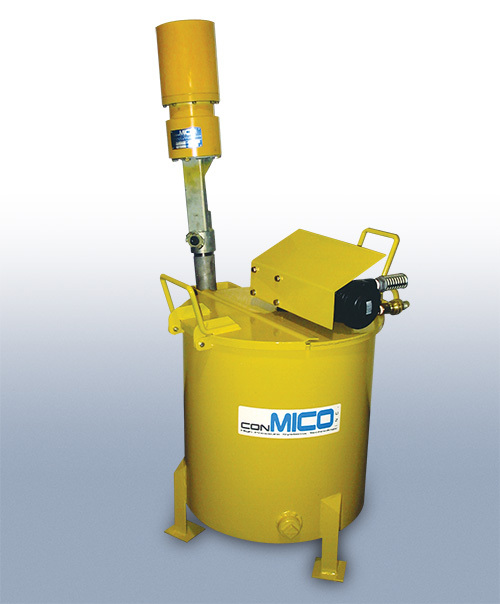 ConMICO 2500W —lightweight, readily portable, robust mixer for full-column grouting.